You can imagine how Subaru must have been feeling as partner Toyota hogged the headlines with its FT-86. 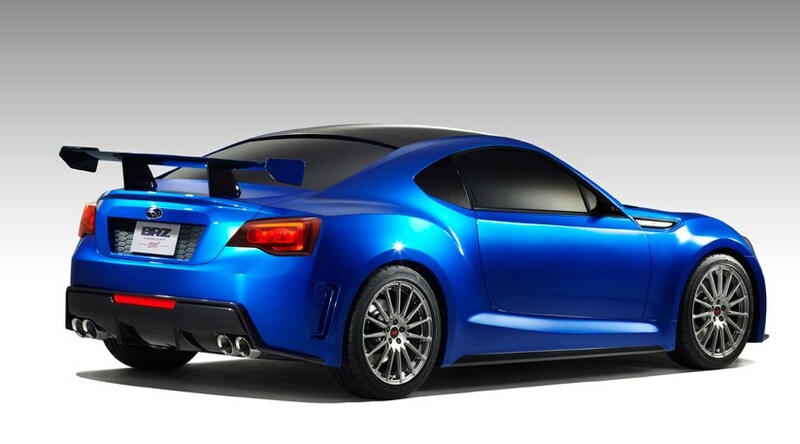 But at long last, someone at Subaru has seen sense and decided to issue an official picture of the new BRZ coupe. This is the Subaru BRZ Concept STi – a rather obviously production-ready glimpse of the new rear-wheel drive coupe, co-developed between Subaru parent Fuji Heavy Industries and Toyota. This coupe will be shown at the 2011 Los Angeles auto show on 16 November 2011 and just one photo has been issued so far. There's precious little in the way of technical information, either. They're just trotting out the usual line about it being powered by Subaru's horizontally opposed boxer engine, which we've known since day one. Extra information we've already gleaned from our recent drive in the Toyota FT-86 include the fact that the boxer engine is likely to be a 2.0-litre four-cylinder boxer, delivering around 200bhp/170lb ft in regular guise. The direct-injection Toyota emits around 160g/km for trim tax bills. But the STi monicker of this concept car is a clear indication that go-faster versions are planned. Witness the enormous rear wing. Any other details on the Subaru BRZ? That boxer engine will allow a very low centre of gravity, promises Subaru, so we are told to expect edgy handling. CAR's resident oversteer-fan, deputy editor Ben Barry, reported that the rear-wheel drive FT-86 test hack he drove was very sideways – but in quite a different way from rally-proven four-wheel drive Subarus of yore. The Subaru BRZ is likely to be a niche car in the UK. Torrid exchange rates will make this one pricey sports coupe, and the UK importer expects sales of only around 500 a year. We reckon on this first evidence, they might be able to nudge that volume up a notch or too. If they can get the price right.